Anytime of year, but especially when escaping the cold, snowy Mainland golf can be a great activity while on Maui. Even if you’re not an avid golfer, if you are on Maui, golf is something to seriously consider. The views, the weather, the food…what more can you ask for? 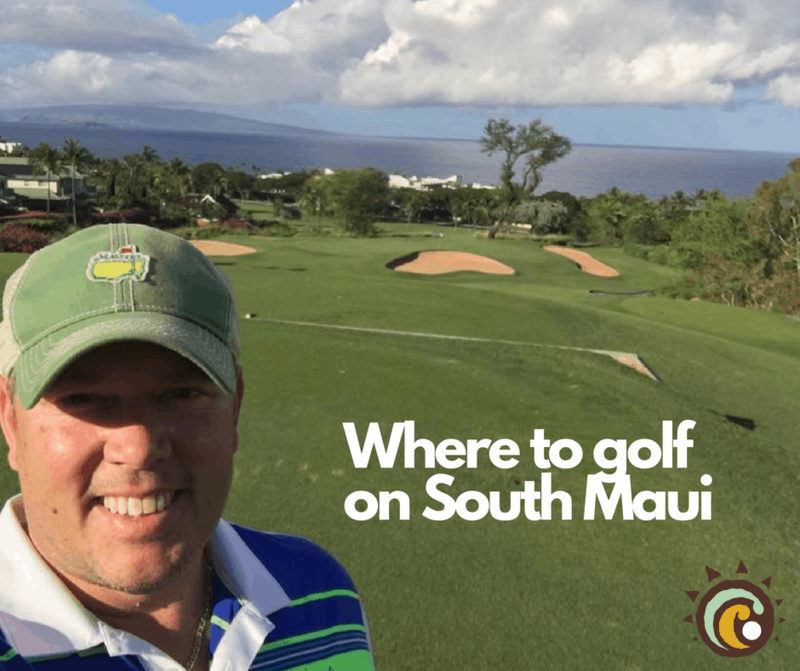 The majority of our properties are on South Maui, so we’re letting you in on a few of our golfing secrets in this area. There is a PGA tour stop about an hour away that you can play as well, and is worth the trip, so we’ve included it in our list below. The Wailea area has three golf courses, Gold, Blue and Emerald. If you are staying in any resort in Wailea (this includes staying at any of our Wailea Ekahi Village properties) and you receive the Wailea Resort rate at all three of the Wailea courses . The three courses include the Blue, Emerald and Gold. The Gold Golf Course is our favorite of the three, while the Emerald is our least favorite. If you are interested in seeing some of the multi-million dollar homes then you will enjoy playing the Blue Course. These are half private, half public, so you need to call ahead to get tee times. There are times when the courses are open for members only. If you are headed up to play the Gold or Emerald Courses there is a nice pro shop from rental clubs to hats, shirts, balls and even golf bags. After your round you can enjoy an awesome ocean view, cold drink and PuPus (appetizers) at Gannon’s. The Blue course was recently redesigned and now has their clubhouse just up the hill from The Shops at Wailea. Though you now miss out on Maui’s best Irish Pub: Mulligans, you gain the open-air bar and great pizza of Manoli’s. if you are looking for the best deals for greens fees then check out Kihei’s Maui Nui. Golf Club. It is a public course,that is fun and challenging for all skill levels, and they have good rates. There is a nice little restaurant at the course as well, with big ocean views for your 19th hole fun: Kono’s on the Green. If you are a beer drinking, I suggested heading up the road about 30 seconds from Maui Nui to hit the Maui Brewing Company’s Tasting Room. They offer brewery tours, food trucks and music. Looking to escape the heat of South Maui while you play golf? Start heading up Haleakala and play at the Pukalani Country Club. A TripAdvisor favorite, you’re sure to get some awesome big view from this UpCountry course. 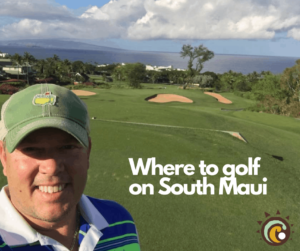 A couple of other good locations to play near the South Side and Wailea are two courses in Central Maui: The Dunes at Maui Lani and Kahili Golf Club. The Dunes at Maui Lani are located near the main shopping area on Maui in Kahului. Driving range, pro-shop, restaurant and great rates are all bonuses of The Dunes. Kahili Golf Club is located back near the airport and Wailuku. Kahili is located in the foothills of the West Maui Mountains. If you have a little rainy weather in South Maui, this is a good option – but try to play early, as the winds do pick up here in the afternoon. There are several good resort courses on the west side. If you are staying in Kaanapali check out the Ka’anapali Golf Course. They have 36 holes and everything you would want at a golf course: instruction, pro shop, driving range, etc. Of course if you want to splurge and play a PGA Tour course, head to Kapalua Golf and play the Plantation Course. You’ll be close to $500 for the round, but it has amazing views and if the wind is blowing in from the ocean, it will be hard to play even par. Equally great views, but as difficult is the Bay Course at Kapalua. Kapalua is in West Maui and about an hour away from our condos in Wailea. As far as golf clubs are concerned, a great resource for rental clubs and tee times is the Maui Golf Shop. We’ve rented clubs from there before and they are all top/newer clubs. If you don’t want to bring your own set, this is an option. They are located in Kihei. We published a blog post on Maui Golf Shop a few years ago, as well. Personally, we usually bring our clubs. The airline charges anywhere fro $0 – $50 per trip (sometimes airline status equals free luggage). If you play 3+ times while on island, renting clubs is not a cost savings. We hope you find this information useful when planning your Maui trip. Please don’t hesitate to reach out if you have any questions or are looking for more information. Happy golfing!